Call us anytime for immediate service. Our dedicated team is available to take your call anytime. Day or night we are ready to provide the assistance you need, when you need it. We provide towing and other services for companies in the Southeast Michigan area. If you have a fleet of vehicles large or small in need a reliable roadside assistance solution, our team at Buckhorn Service is ready to meet all your needs. We are equipped to take the hassle out of handling breakdown situations, our friendly staff will get the right equipment on location in minutes. Buckhorn Service began in Lake Orion as a small gas station and garage with 1 wrecker. 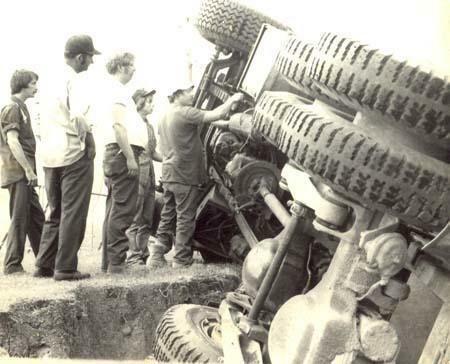 The Feltz brothers, Butch and Ron ran the company together providing towing and mechanical services. Over time the business grew into a larger building with a storage lot, where the operation became focused on towing and recovery. The Feltz brothers had a reputation for being dependable and honest. The fleet has since grown to over 20 trucks and has helped thousands of motorists in Lake Orion and surrounding areas. For over 35 years we have been providing dependable roadside assistance to motorists. We provide services for every type of vehicle on the road, from everyday drivers to heavy duty trucks. Our flatbed wreckers are also well-suited for moving machinery, atvs, sheds, hot tubs, or other items.